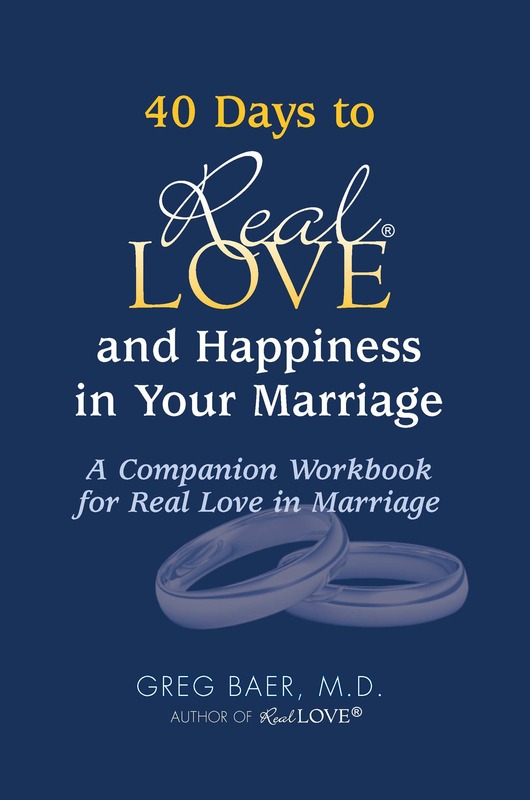 40 Days to Real Love and Happiness in Your Marriage: A Companion Workbook for Real Love in Marriage, by Greg Baer M.D. "After reading 40 Days to Real Love and Happiness in Your Marriage with my husband, we are falling in love—Real Love—together, even though we’ve been married for years. We have become the best friend for each other that we had always wanted to be. The exercises and questions in this book are tremendous—divinely inspired in my opinion. A real gift of love to my husband and me." The book Real Love in Marriage has helped uncounted thousands of couples all around the world to create and maintain richly rewarding marriages. 40 Days is a companion workbook for Real Love in Marriage and provides exercises, questions, and additional content that make the principles in the Marriage book much easier to apply in daily life. Take the 40 Day Challenge and transform your marriage! 40 Days to Real Love and Happiness in Your Marriage is also available for the Amazon Kindle here.